Last night my husband and I headed in to downtown Portland for a book release event at the Jack London Bar. 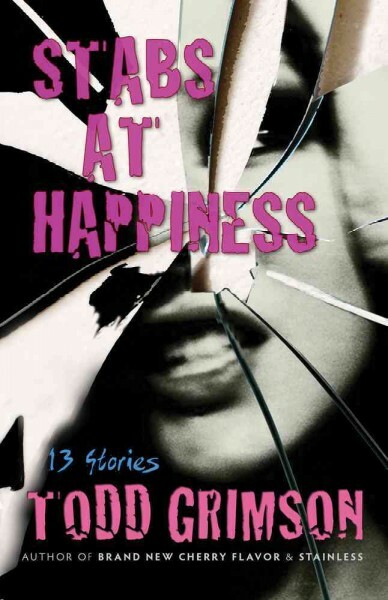 The featured book was Portland-based author Todd Grimson’s newly-released collection of short stories Stabs at Happiness: 13 Stories. Todd Grimson was the winner of the 1988 Oregon Book Award for fiction for his novel Within Normal Limits. He’s been described by the UK-based newspaper The Guardian as “the greatest horror writer you’ve never read.” He is the author of the supernatural zombie thriller Brand New Cherry Flavor: A Novel of the Occult and the vampire love story Stainless: A Modern Romance. I finished Stabs at Happiness: 13 Stories yesterday morning, and I’d classify the book in the realm of literary fiction, as there are no stories about vampires and zombies in this one. The majority of the stories are character-driven, including sketches of a 1970s New York transvestite and a scientist at a secret underground lab in the southwestern United States. One of Grimson’s greatest strengths is creating well-developed and elaborate settings, and those featured in Stabs at Happiness are quite diverse — the Amazonian jungle, the casbahs of Morocco, and even pre-Castro Cuba. Due to his battle with multiple sclerosis, Grimson was not able to attend the launch party of his book. Rather, four local actors and artists read individual stories from his latest work. Local entertainer Efra Lopez joked that he was selected to read the book’s first story “Hurt’s Rescue” because of his Latin American accent. Set in the jungles of South America and somewhat reminiscent of Joseph Conrad’s “Heart of Darkness,” the story follows the river boat journey of American-born Tranh and several local guides as they search for a British anthropologist who disappeared in the Peruvian jungle six years prior. Drammy Award-winning actress Andrea White read “What the Matter Is,” a story loosely based upon an historical event in which the actress Jean Harlow went missing. My favorite story in the collection was “Nothing in Tangier,” set in the coastal Moroccan town and involving mysterious events surrounding the lives of a young couple on vacation from Seattle. At nearly 40 pages, it is by far the longest story in the book. According to his publisher Schaffner Press, Grimson was inspired to write this story after participating in a writers’ worshop in Morocco. I enjoyed it because it was a bit more philosophical than the other stories, delving into the superstitions surrounding a belief in luck and immaterial connections with wealth. Reading this book reminded me that I don’t read nearly enough collections of short stories and essays. Because I have a tendency to be reading an average of 3-5 books at any given time, I appreciate the short commitment required to enjoy a work of only a few thousand words. This entry was posted in Movie Reviews/Book Reviews, Oregon and tagged book reviews, fiction, literature, short stories, short story collections, Todd Grimson. Bookmark the permalink. wish i could have gone to the event..